We have gained immense expertise in offering Weber - Tile & Stone Fixing Solutions at clients' premises. The offered range is processed using superior grade ingredients at reliable associates' base. Our vendors make sure to offer this using innovative techniques so as to ensure its long lasting effects and high compressive strengths. Quality personnel make sure to check the entire range on different characteristic so as to ensure its compliance with thew industry laid norms and standards. 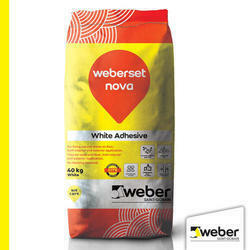 Weberset nova is a polymer modified Cementitious tile adhesive used for fixing vitrified tiles, ceramic tiles and stones of regular size on floor with regular traffic. It is applicable for internal and external floor for stones, high bond strength. Weber epoxy adhesive is a three component, heavy duty, chemical resistant adhesive for fixing tile & stone of small & big format on wall & floor. It provides excellent, high durable bond strength for fixing tile & stone on metal surfaces. 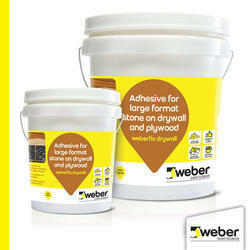 weber epoxy adhesive can be used in wet, internal and external areas. Due to its chemical resistant properties, it can also be used in commercial installations of chemical prone areas, food processing industries, commercial kitchens, restaurants, high traffic and workshop areas. It has excellent adhesion properties, tile & Stone can be fixed on the surface like metal sheet, aluminium panels, glass, plywood and gypsum board. It can be applied to wet areas, internal and external applications. Due to chemical resistant properties, it can be used on floor & wall in chemical prone areas. It can be applied at the higher height level where the cement based adhesive has limitations. Shake the bottle well of resin & hardener prior to mixing. Take 2 part resin, 1 part hardener & 9 part filler by weight. Thoroughly mix the resin & hardener in a clean container for a minute. Add 70 % of filler and mix it for 2 minutes. Then add balance 30 % of filler and mix the entire component for 5 minutes to get a homogenous paste. Weberfix drywall is a 2 component high-performance tile and stone adhesive, which can be used for almost all types of tiles, over almost all types of substrates including green and moisture sensitive marble & agglomerates. Weberfix drywall is specially formulated, for fixing large format tiles & stones on drywall and plywood. Moisture free system: Does not damage wooden substrates or tiles, and water sensitive stone. Very High Bond strength 2 Component adhesive: prevents wastage, as only quantity which is required has to be mixed. Can do cladding up to 50 ft. height, without any support bracket. Under tile treatment of stone (to prevent discolouration) is not required. Can be used on touch dry surface of the concrete. Do not need to wait for the substrate to get completely dry. For large and heavy stones, initial support required for at least 5 hours for vertical application. Not for fixing Metal or glass tiles. 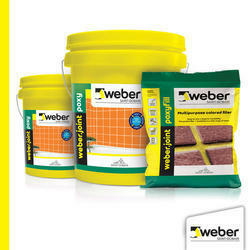 Use Weber bond poxy for fixing metal and glass tiles. Substrate should be structurally sound, clean and free of all bond inhibiting compounds, like dirt, oil, grease, paint, sealers, curing compounds, laitance etc. Rough or uneven concrete surfaces should be made smooth and allowed to cure. While dirt can be cleaned with just water, surfactants may be required for oil, grease etc. Please ensure the use of proper personal protective equipment (PPE) before handling the product. Take 3 parts component A, and 1 part component B, by weight (9:4 by volume) in a bucket / other suitable containers. Mix for 3-5 minutes, preferably using a slow speed stirrer (100 rpm), or using any other suitable method. Mixing at high speed should be avoided. Mix only the quantity of adhesive, which can be consumed in 10-15 mins. Wash tool immediately with water, after use, and before the adhesive hardens. No water to be added to the mix. Weber.set plus-white is a polymer modified cementitious white tile adhesive used for fixing ceramic tiles, vitrified tiles, glass mosaic and stones of regular size on walls and floors with regular traffic. It is especially recommended for glass mosaic and stones due to its white colour which adds to the aesthetic look. It is ready to mix; a single component product. It has excellent adhesion properties, no slip is observed on vertical applications. Shrinkage cracks are minimized/eliminated due to its self-curing properties. The tiled floor can be made available for foot traffic after 24 hours. It is recommended for application on cementitious substrates, self-levelling screeds, fibre cement boards and blocks. It is suitable for wet and dry conditions including swimming pools and fountains. Clean the substrate of oil stains and bond inhibiting compounds. Also remove dirt, dust and laitance, if any, using high-pressure water jet or any other suitable method. Ensure that the substrate is flat, stable, well adhered and has a normal absorption. Concrete screeds render and block work should be cured sufficiently to avoid the shrinkage cracks. 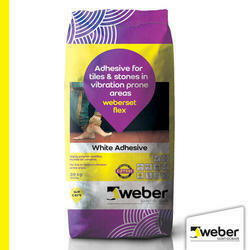 Correct the local undulation/damage on the substrate at least 48 hours before the application of Weber.set plus-white. Saturate the surface well and remove excess water before application of the tile adhesive. Gradually add 2.5 parts of powder to 1 part of water (by volume) and mix it to a smooth, workable paste using a suitable stirrer or a low-speed drill mix. After mixing allow the mixture to stand for 2 minutes for it to mature. Apply weber.set plus-white over the surface using the straight edge of the notched trowel and then comb the applied adhesive using the notched side of the trowel to achieve the desired thickness. If the adhesive is buttered to the tile, then ensure proper coverage of the tile surface to evade voids. Firmly press the tile into the adhesive to ensure good adhesion. Flexible adhesive, which allows it to sustain low to medium vibration in the substrate. Suitable for Internal as well as external use. Highly polymer modified: provides high structural adhesion, which allows being used on a variety of substrates, for fixing a variety of tiles and stones. Can be used for new construction, as well as for renovation over existing floors/facades. Low VOC - for healthy living. No Hacking of substrate required to achieve the required bonding. Self-curing properties, which allows for no-hassle application, with minimum labour. Free flowing product, makes it easier to mix and apply. No sag formula: allows for hassle-free application on vertical walls, without any slippage. 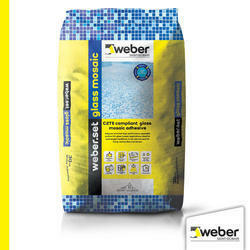 Water resistant, making it suitable for swimming pools, bathrooms, kitchen, saunas and spa. Sustains heat ageing, making it ideal for high-temperature locations for outdoor use, and also for hot temperature applications, like Jacuzzi, sauna etc. Do not use on wet screed or plaster. Surface must be fully cured. Do not use on gypsum plaster or boards, fibre cement boards, or other drywall partitions. Can only be used on cementitious waterproofing. Do not use on epoxy or polyurethane waterproofing. Do not use for Installing glass tiles or metal tiles. 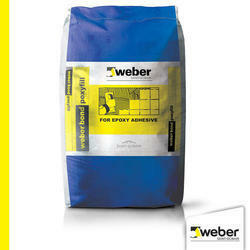 Use only Weber bond poxy, for fixing glass and metal tiles. Do not use on Metal, rubber, plastics, vinyl, linoleum surface, painted substrates. Do not use on surfaces subject to heavy vibrations. Use Weberfix drywall for areas subjected to heavy vibrations. Do not use for fixing artificial stone or impregnated stone. Use Weberset ultra for the same. It is a three component, chemical resistant joint filler for heavy duty application. Recommended for areas where hygiene is of utmost importance. Used for internal and external application. 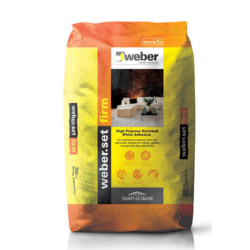 Weber.set firm is a polymer modified cementitious tile adhesive used for fixing all types of tiles and natural stones like marble, granite on the wall and floor. It is also suitable for fixing any porosity tile over any cementitious substrate. It is recommended for windows and door frames. It is recommended for application on cementitious substrates, self-levelling screeds and fibre cement boards. 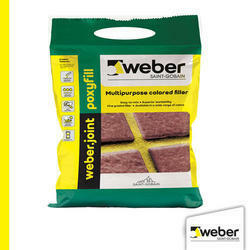 It can also be used for old tiles (porous and non-porous) on walls using Weber.tec prime and renders for both interior and exterior surfaces. Can be used for wet and dry service condition including swimming pools. Clean the substrate of oil stains and bond inhibiting compounds. Also remove dirt, dust and laitance if any using high-pressure water jet or any other suitable method. Correct the local undulation/damage on the substrate at least 48 hours before the application of Weber.set firm. Apply weber.set firm over the surface using the straight edge of the notched trowel and then comb the applied adhesive on the notched side of the trowel to achieve the desired thickness. If the adhesive is buttered to the tile, then ensure proper coverage of the tiled surface to evade voids. Firmly press the tile into the adhesive to ensure good initial bonding. Our customers can avail Weber Color Fine from us. The offered range of cementitious water repellent tile joint filler is known for its usage in filling tile joints of ceramic tile, vitrified tiles, marbles, granite, mosaics and natural stone in walls and floors for both internal and external application. Along with this, the offered range is available in different specifications and compositions so as to comprehend and meet the assorted requirements of clients. water repellant tile grout used for an internal and external application. It is suitable for grouting ceramic tiles, vitrified tiles, marbles, granites, mosaics, and natural stone in walls and floors. 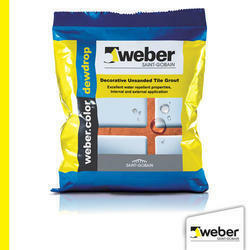 Weber.color dewdrop is recommended for use on tile joints of 1-6 mm width. Keep the grouted area free from dust particles for a minimum of 24 hours. For best results use spacers and keep a minimum 2 mm joint between tiles. If the tiles are highly porous, do a sample test to check for possible staining. To avoid this problem, mask the tiles before grouting. It is a three component, chemical resistant joint filler for heavy duty application. Recommended for areas where hygiene is of utmost importance. Used for an internal and external application. Substrates:Application on walls and floors in internal and external areas. Chemical Industries: Laboratories, production and storage workshops, paper mill dyeing plant, tannery, food industries. Breweries, laboratories, commercial kitchens, workshops, dairies, processing plant. Hospitals: Operating theatres, clinics, showers, kitchens. Wet Areas: Collective shower, bathrooms, seawater pools. Others: Garages, battery rooms, public toilets, waste treatment plants, podium parking areas, high traffic areas. 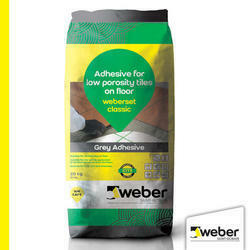 Weber epoxy is recommended for use on tile joints of 2-12 mm width. Ensure 24 hours time interval for grouting after tile fixing. Clean off the excess of weber epoxy from the joints before it hardens. If the tiles are highly porous, do a sample test to check for possible staining, to avoid this problem mask the tiles before grouting. Tiles fixed with weber epoxy should be grouted with the same product. Tools must be immediately cleaned after usage. Use protective gloves and avoid contact with skin & eyes. Surface PreparationClean and remove any loose particles, laitance and dust from the tile joints before grouting. Take 2 parts resin, 1 part hardener & 8 parts filler by weight. Mix the resin & hardener for a minute. Add 80% of the filler and mix it for 2 minutes. Then add balance 20% of filler and mix all the components for another 2 minutes to get a homogeneous paste. Before application, wear rubber gloves and start filling the tile joints with a rubber trowel or any other appropriate tool. Remove the excess material by placing the rubber trowel or any appropriate tool, perpendicular to the tiled surface. As the epoxy grout start gelling after 30-45 minutes (depending upon the site temperature) start the initial cleaning with a scrubber and soap water solution. Finally, clean the tiled surface with a dry cloth. It is ready to mix a single component product, just add water in the specified proportion and apply. The tiled floor can be made available for the foot traffic after 24 hours. It is suitable for heavy duty applications with moderate structural movements. It is recommended for external cladding. It is suitable for fiber cement boards, gypsum boards and renders for both interior and exterior surfaces. It can be effectively used on vinyl tiles, plywood, old tiles (porous and non-porous) and on the wooden floor using weber.tec prime. A flexible, cement based polymer modified tile adhesive for internal and external use, especially for Glass Mosaic. It is suitable for fixing all types of ceramic wall and floor tiles, mosaics, marble, terrazzo, natural stone, brick slips and glass blocks in dry or wet areas, including swimming pools. It is particularly suited for areas with some movement, deflection or limited shrinkage is likely. It has the finest particle size which makes it easily workable enhancing the colours of the glass mosaic tiles. Weber.set glass mosaic has extended open and adjustability times making installation easier with no sagging or slippage. Being a high strength, flexible tile adhesive it can be used for heavy-duty applications on a variety of substrates. Brightest white adhesive enhances the colour of glass mosaic. Free flowing powder, having long open time & prolonged workability when mixed as a paste makes it easy to install. No hacking required-having a high bonding strength it can be used to fix tiles & stones on various substrates. Being self-curing it optimizes the usage of water and labour at the site. Being water resistant it can be used to fix various types of tiles including glass mosaics in swimming pools & other wet areas like showers, bathroom etc. It can sustain heat ageing. It has no shrinkage and is particularly suited for situations where some movement, deflection or limited shrinkage is likely. Absorbs dynamic loads which make it suitable to use in swimming pools where the water pressure or load may vary in a filled swimming pool and an empty swimming pool. Can be used at depths up to 10 meters underwater which makes it particularly suitable for swimming pools. Specially designed adhesive for application in submerged conditions. Ready to mix product only water to be added. Extra white slip resistance with longer pot life. Clean the substrate of oil stains and bond inhibiting compounds. Also remove dirt, dust and laitance, if any, using a high-pressure water jet or any other suitable method. Correct the local undulation/damage on the substrate at least 48 hours before the application of weber.set glass mosaic. Saturate the surface well and remove excess water bringing the surface to a touch dry condition before application of the tile adhesive. Gradually add 2.5 parts of powder to 1 part of clean water (by volume) and mix it to a lump-free, smooth, workable paste using a suitable stirrer or a low-speed drill mix. 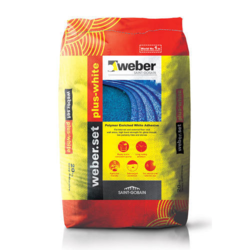 Weber.set ultra is a two component high performance, polymer modified adhesive for fixing impregnated stone, tile and large format tile and stones where nominal to moderate substrate movement is excepted. Weber.set classic is a polymer modified cementitious tile adhesive for fixing ceramic tiles vitrified tiles and porous natural stones of regular size on wall and floor, over old tiles and other flooring material. It can be used over cementitious & self-levelling screeds for internal applicants only. It can be conveniently used for tile on tile application as it does not involve removal of earlier mosaic tile hence no debris, no dust. It is recommended for application on cementitious substrates, self-levelling screeds and fiber cement boards. Concrete screeds, plastered surfaces, block work and renders should be sufficiently cured to avoid shrinkage cracks. Correct the local undulations/damages at least 48 hours before the application of Weber.set classic. Gradually add 3 parts of powder to 1 part of water (by volume) and mix it to a smooth, workable paste. After mixing allow the paste to stand for 2 minutes for it to mature. Apply weber.set classic over the surface using the straight edge of the notched trowel and then comb the applied adhesive on the notched side of the trowel to achieve the desired thickness. If the adhesive is buttered to the tile, then ensure proper coverage of the surface to evade voids. Weber.set premier is a polymer modified Cementitious tile adhesive for fixing ceramic tiles of regular size on the wall and floor and porous natural stone on the floor. For internal floor and wall areas, for fixing tiles. 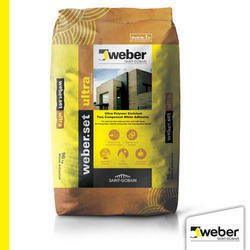 Correct the local undulations/damages on the substrate at least 48 hours before the application of weber.set premier. Apply weber.set premier over the surface using the straight edge of the notched trowel and then comb the applied adhesive on the notched side of the trowel to achieve the desired thickness. If the adhesive is buttered to the tile, then ensure proper coverage of tile surface to avoid voids. 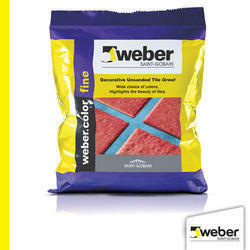 Looking for Weber - Tile & Stone Fixing Solutions ?